Pain At Plate: Heat Ups Pitcher Retaliation It's been known for years that when temperatures are hotter, pitchers are more likely to hit batters with pitches. A new study finds that heat also increases a pitcher's likelihood of retaliating by hitting an opposing batter when players from his team were hit earlier in the game. 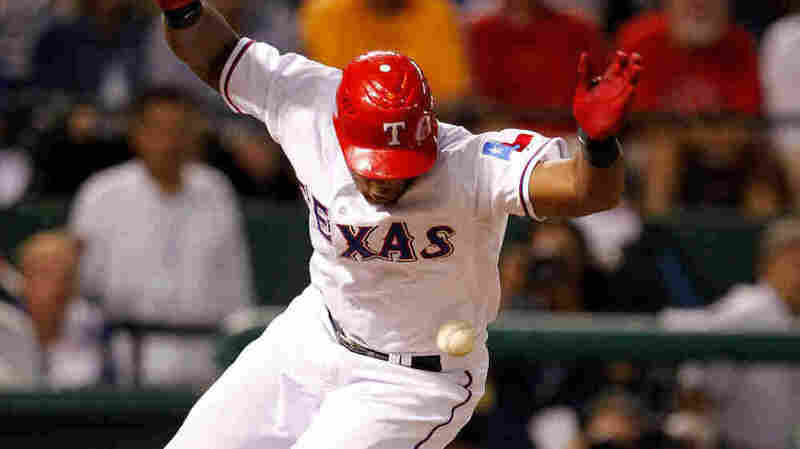 Adrian Beltre of the Texas Rangers is hit by a pitch from the Tampa Bay Rays' James Shields on Oct. 1 at Rangers Ballpark in Arlington, Texas. Richard Larrick has been bothered by something for two decades. "Twenty years ago, I'd done a paper with some graduate students just showing that in hotter temperatures, pitchers are more likely to hit batters with pitches," says Larrick, a professor at the Fuqua School of Business at Duke University. Was it because they would sweat more, and the ball might get slippery and hard to control? Or was it something intentional? "Laboratory research has shown that if you put people in a hotter room, they're more likely to act aggressively toward someone else," sometimes without even being aware of it, he says. Because ballgames aren't played in a lab, Larrick looked through 50 years of baseball statistics to see if he could see the effect of temperature on aggressive behavior. "We can look at every game and every plate appearance, and just look at what the chances are of a batter being hit," he says. As he reported in the journal Psychological Science, there was a definite pattern. Pitchers were more likely to hit a batter if earlier in the game, one of their teammates had been hit. But that's not all. It's been known for years that when temperatures are hotter, pitchers are more likely to hit batters with pitches. A new study finds that heat also increases a pitcher's likelihood of retaliating by hitting an opposing batter when players from his team were hit earlier in the game. The chart below shows a batter's percent chance of being hit in a plate appearance, depending on the number of players that have been hit on the pitcher's team and the gametime temperature. "It seems to be that the main thing that changes with temperature is the desire to retaliate for my teammate being hit," says Larrick. He says that fits well with what his laboratory research shows about people in hot rooms. "The same thing that someone else does to me, that could be ambiguous, whether it was designed to hurt me or not, is more likely to be interpreted as having hostile intent, which then provokes me to want to retaliate for it." Larrick doesn't know for sure if his theory about retaliation is correct. All he has to go on is the numbers. "I don't actually have any, any idea if this resonates with the players themselves," he says. "I think there could be something to that," says Billy Ripken, a former major league player who is now an analyst for MLB Network. He says as a batter, you rarely know whether a pitcher has hit you on purpose. "If you may be given a choice of saying, 'Was that an accident or was it not an accident?' and you're a little bit irritable, you might say, 'You know what? I don't care. I didn't like it.' "
And there's no question that for baseball players, the dog days of summer can be annoying. "When you're playing in Baltimore, New York, Atlanta in the middle of the summer, it's 95 degrees and 95 percent humidity, it's pretty miserable," says Ripken. But Ripken's colleague at MLB Network, Dan Plesac, has another explanation for Larrick's data. Plesac was a major league pitcher for 17 years. He says it's a mistake to think that pitchers retaliate right away. Sometimes things happen early in the season against a particular team when, for whatever reason, you'd like to retaliate but can't. "So you kinda put that in your file of, 'OK, the next time we play them there or they come to our place ... we're not going to forget what happened in April or May,' " says Plesac. And frequently, that second meeting is in the middle of the summer. Is Plesac right? You don't hear this too often in sports stories, but the answer probably is that more research is needed.